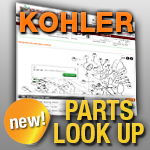 Jacks is proud to carry replacement Kohler ignition parts. If you need a replacement Kohler ignition coil, voltage regulator, ignition module, condenser, ignition kit, or any other parts for the ignition system of your Kohler engine, Jacks is always the best place to go. If you need a tune up kit, we have those too!